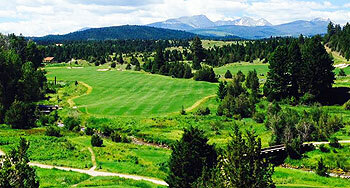 Montana is not a State that naturally springs to mind when thinking about golf. It’s more likely that Custer’s Last Stand at the Battle of Little Bighorn will feature foremost in your thoughts. It seems poignant therefore that Montana’s first truly world-class golf course should be constructed on part of the historic Grant-Kohrs Ranch that once extended to around ten million Montanan acres. The original Grant-Kohrs Ranch was subdivided over the years. In 1971, a Kansas City businessman bought 28,000 acres at Deer Rock, naming the property “Rock Creek Cattle Company” and it was sold in 2004 to Texan, Bill Foley, who founded the financial services company Fidelity National. Bill Foley is not shy to point out that he is “an accomplished golfer, who was ranked in 2004 by Golf Digest as one of top five executive golfers in the world”. Consequently, careful thought was required to decide which architect to appoint to design his golf course. Most owners in Foley’s position would have selected Jack Nicklaus or Tom Fazio or perhaps one of the Joneses, but Foley selected Tom Doak who has carved a very different niche through minimalism and less is more as a guiding design philosophy. If you are serious about golf course rankings, then you need an architect who has a track record and Tom Doak has more designs in our World Top 50 than any other living architect. 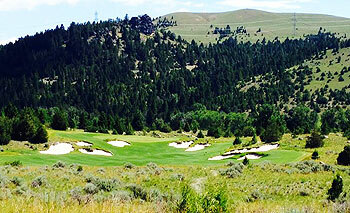 The Tom Doak-designed golf course at Rock Creek Cattle Company opened for play in 2008, competing with the 10,000-foot backdrop of the sometimes snow-capped but always dramatic Flint Creek Mountain Range. “Only an exceptional golf course could hope to vie for attention with the natural wonders of the Rock Creek property and of greater Montana,” commented Doak. Who could argue? This is a most glorious location for golf. 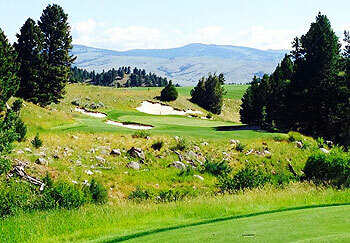 Measuring 7,466 yards from the backs and 5,445 yards from the forward tees, Rock Creek Cattle Co caters for golfers of all abilities and despite nice changes in elevation, it’s designed for walking, with green and next tee situated a short pitch away. Routed meticulously across 350 acres of rugged, rock-strewn terrain with Rock Creek itself coming into play – with an occasional fly fisherman for company – this is modern golfing in its most natural form. In 2017, Eric Iverson and Tom returned to Deer Lodge to alter the 18th hole by moving the green such that the creek comes into play when taking this par five on in two. Owner Bill Foley allowed Tom Doak to site his golf course anywhere on Foley's 30,000 acre ranch and Doak picked out a fine site. The splendid mountain scenery adds to the experience, but the golf would be excellent in any location. I found the par 4s to be the course's greatest strength. Time and again, Doak gives the player a wide fairway with a definite better side to set up the approach. Once on the green, the real challenge begins, with exceptionally contoured greens. Some have suggested the contours are excessive, but I found the speed reasonable enough to make for a proper challenge. The course is configured in one large loop, with the front nine climbing to the highest point on the course and the back taking the player to the lowest spot--the 17th green--before a gentle climb up the final fairway. Doak is in the process of moving that green closer to the Rock Creek, so it will be interesting to see how the course plays after that alteration. Rock Creek Cattle Company may have been built for walking, but a lovely walk in the park it is not. The trips from green to tee are excessive.........which probably accounts for the fact that the vast majority of rounds are played in carts. That, however, is the only shortcoming I found. Not many people know where Deer Lodge, Montana is located, and furthermore, it’s an even smaller subset of people who actually plan a golf holiday at Deer Lodge, Montana! However, Tom Doak changed all that in 2008 as the Flint Mountain Range towers above what many regard as an exceptional course in Doak’s portfolio. There’s a 6.5 mile gravel road up to the Cattleman’s Club, which is populated with Longhorn Cattle roaming along the driveway. I was a little apprehensive driving up that seemingly endless gravel road at 30pmh as the thought of not finding a golf course ran through my mind more times than it should. I was relieved to receive a warm welcome and was thoroughly impressed with the landscape. The fairways at Rock Creek are extraordinarily wide, and the Kentucky blue-grass on the fairways ensure you’ll have a perfect lie for each approach shot. The opening holes are relatively flat, although as early as the 2nd hole you start teeing off without the ability to see the landing area. You quickly start playing holes with significant changes in elevation with holes 6 and 7 also playing to blind landing areas. The 7th hole is a sharp dog-left left with a downhill approach shot. The approach feels like you’re playing the iconic Alps hole, just from an elevation. The par 3 8th hole is arguably the signature hole on the property as you play over the rock creek into a bowl shaped green that falls from left to right. The angles that Doak created off the tee are marvelous and tease the golfer into hitting to the correct side of the fairways. I certainly enjoyed the frequent dog-leg movement to many of the holes and hitting tee shots to plateaus that position you for your next shot. The green complexes in my opinion were too severe with humps and contours that don’t lend themselves to an enjoyable putting experience. Although I appreciate variety, I found that these greens don’t always reward well struck approach shots and will never yield many birdies. Many players remarked that you have a wonderful ball-striking round and walk away with 38 putts. Stand-out holes for me were the par 4 4th hole which plays as handicap one. The fairway climbs uphill to a punchbowl green surrounded by dense vegetation. Many players also thoroughly enjoy “the loop” which is the closing stretch of 16 through 18. The 16th is a long par 4 which moves slightly dog-leg left uphill into the mountain, followed by a spectacularly framed par 3 17th with the rock creek meandering its way around you. The closing par 5 18th hole from the elevated tee offers a breath-taking view of the property and takes you back to the clubhouse. There’s been talk for years of moving the 18th green over to the other side of the creek, but that theory has yet to transpire. The owner decided to name each hole after a famous Western Movie, and the Cattleman’s Clubhouse echoes the rugged spirit of the Wild West. The half-way house has the most mouth-watering Elk Jerky, which in and of itself is enough reason to book a vacation in Deer Lodge, Montana! Geronimo!